In my last post, I wrote a letter to my friend Sydney thanking her for many things. 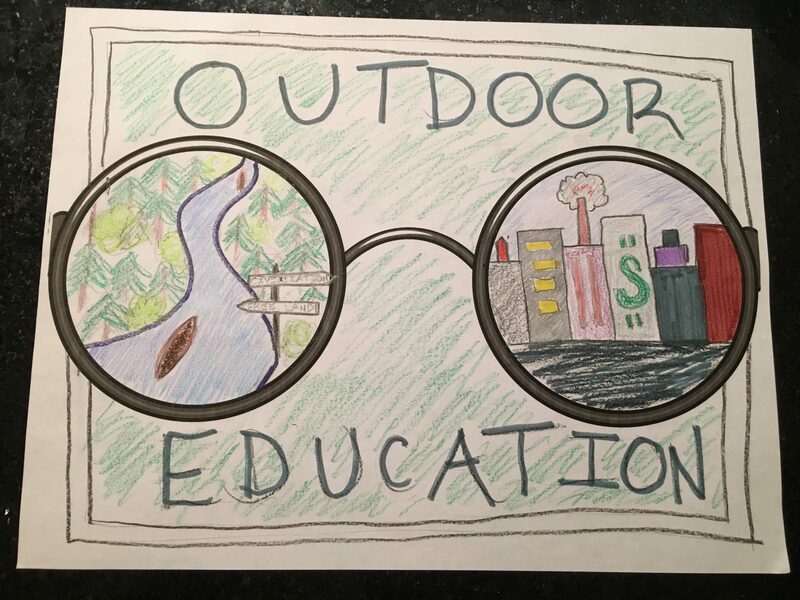 On the surface, this letter seems very simple; however, this letter is not only a thank-you but also demonstrates my understanding of eco-literacy. Two of my classmates that also had similar understandings to my own are Robyn and Raylin. All three of our posts express gratitude to someone else for teaching us how we can be more eco-literate people. As just said I am thanking my friend Sydney in my poem, Robyn is writing to someone named Alissa and thanking them for being an eco-literate person and Raylin discusses how she is grateful for what she learned from her grandmother’s garden. In Robyn’s blog post titled “Dear Alissa” one of the very first lines is, “[t]he empathy and recognition you have for all life forms is truly inspiring” which reminded me of my letter to Syndey where I mention my gratitude for Sydney for never putting herself above other animals and always being respectful. Raylin also discusses this mutual respect between person and animal in her poem/letter titled “Secret Garden”. Raylin explains how her grandmother and the garden taught her about animals’ and plants’ importance to us. In one line she says how she is thankful for learning “[t]hat a flower has as much life as us / That without them / We cannot be” demonstrating her understanding that plants are far more beneficial to this world that we as humans sometimes recognize. In the book Braiding Sweet by Robin Wall Kimmerer, reciprocity is mentioned many times. Kimmerer uses this word to help readers to understand that eco-literacy is more than “going green” (or whatever other environmental slogans you want to use) but it is also about recognizing what the earth gives back to us and reciprocating those gifts. One thing that both Raylin and Robyn discuss that I do not think I mention is this idea of reciprocity. In “Dear Alissa” one of the lines talks about how Alissa is always “[r]especting the environment as a gift from mother nature herself.” To me, showing respect is a form of reciprocity. Raylin also mentions how the garden reciprocates the earth’s gifts to us by being a “secret oasis … for all living things”. These poems and letters can be used to help learn about eco-literacy and understand different ways we can all be eco-literate. I am writing this letter to thank you. Thank you for answering any question I have ever had about nutrition and it’s connection to the environment. Thank you for inspiring me to take the leap to consuming less meat. Thank you for sharing articles and documentaries about climate change with me. Thank you for continuing to educate yourself and committing yourself to being conscientious of your impact on the environment. Thank you for keeping a positive attitude towards disrupting climate change and focusing on positive change instead of dwelling on the negative. Thank you for never being condescending or holding yourself higher than others including the earth and its animals. Since I have become interested in being a more eco-friendly person you have been the one I have turned to for questions about consumption in general and more specificallynutrition and cosmetic products. I am also grateful for how you will listen to me for hours on end talking about whatever new environmental challenge I have decided to take on, and how, if I fail you never show judgements and instead just offer encouraging words to help me try again. You are also always interested in what I learn in school about education, especially Treaty Education, and how that is connected to your studies as a Nutrition student. You, Sydney, are an eco-literate person that I look up to for so many things and I am so grateful to have you on my journey to becoming more eco-literate. In ESCI 302, we were asked to look into a movement called The Leap Manifesto. This movement encourages people, governments, and really, the entire world to take the leap into a more sustainable lifestyle that will help to disrupt climate change. This manifesto along with the documentary Before the Flood encouraged me to finally take the leap to being a vegetarian. I have not eaten red meat for nearly two years and in February I decided to stop eating chicken as well, but I was still eating seafood. There are many reasons for the change in my diet but the main reason was that of the meat industries’ harmful effects on the environment. 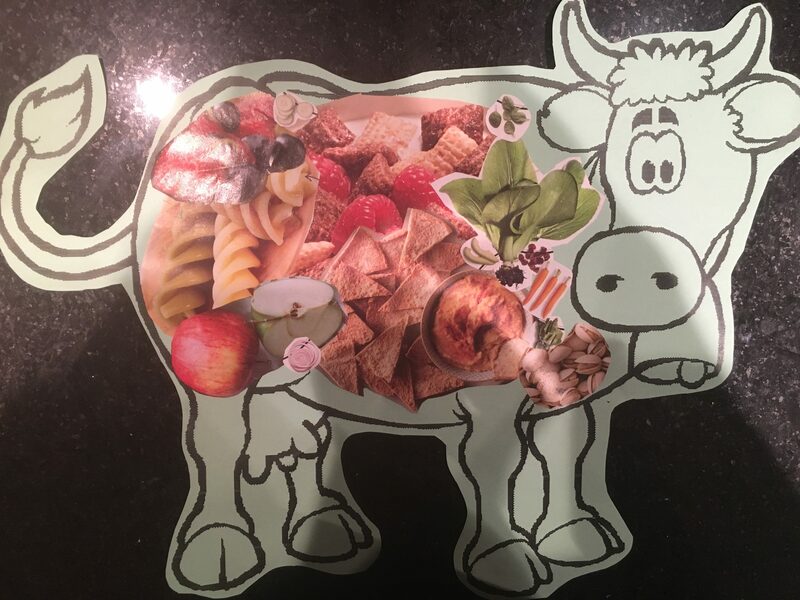 For my second creative journal, I filled in the outline of a cow with a collage of photos of food found in magazines. If you look closely at the different magazine clippings you will notice that there is no meat in any of them. This journal entry is supposed to represent what I will be eating as a replacement for meat. Another thing that makes me a bit nervous about this new transition is the stigma there is around vegetarianism. I have decided that another powerful action I will take is to try and educate people on how consuming less meat can help reduce greenhouse gas emissions. To confidently do that, however, I first have to educated myself which leads to the first action I will take along with becoming vegetarian; I have started reading Eating Animals by Jonathan Safran Foer. If you know of any other resources I should check out to help this transition please comment below. I am excited and anxious for this new change! CJ1 – So What Does Environment Mean Anyway? 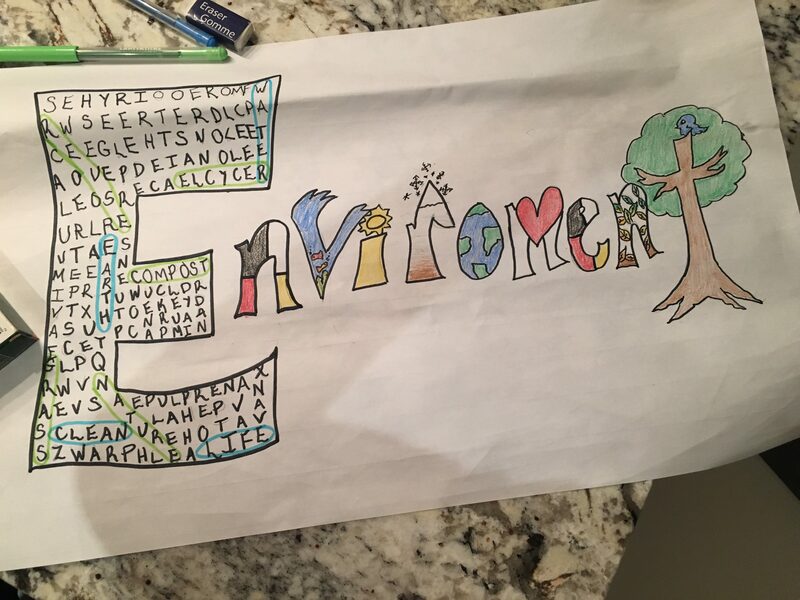 For my first creative journal, I chose to draw a word picture using the word environment. Throughout the picture, I included drawings of things that I think of when I hear that word. As you may have already noticed, the second n in “environment” is missing. I realized after I had already completed the drawing that I spelled the word wrong (don’t worry my major isn’t English). Although this was completely unintentional I found it to be quite metaphorical. Often we as humans can be so focused on the task at hand that we forget to take in the big picture around us. The letter T in my drawing is a tree with a bird which reminds me of walking through Narrow Hills Provincial Park and listening to the birds sing. A specific time that I always feel connected to the environment is when I go to my stepdads cabin at Narrow Hills. My time at the cabin consists of walking through the trails, swimming in the lake, and sitting by the campfire. In the park, there is no cell phone reception so you are completely unplugged. There I really get to focus on mindfulness and truly breathe in my surroundings more than any other place I have been. Although I believe technology has many great purposes I also think it is important to teach students how to detach themselves from their devices. In Braiding Sweetgrass, Robin Kimmerer writes about how much there is to learn from the land as long as we, as students, are mindful and that is what I believe part of environmental education is: Learning to be mindful and how to influence our students to do the same. Here is my Summary of Learning for ECS 210. To read more about what I have learned this semester checkout the ECS 210 category!